Games Charm is the PUP that uses misleading techniques to prevent removal. Use Reimage to locate malicious components and get rid of them faster than with uninstall instructions. A full system scan blocks virus reappearance and prevents traffic to malicious domains. Why should you keep away from the Games Charm virus? If you are an online gaming enthusiast, we should warn you to that Games Charm virus is a computer threat you should look out for. This program has been deemed by the cyber security experts as a potentially unwanted program, despite its claims to provide the users with a reliable and exciting gaming service. Unfortunately, the application is nothing more than an adware-type program, which will generate numerous ads and links and inject them on your browsing results. It should also be noted that the Games Charm hijack usually occurs without the user’s consent. Nevertheless, stealthy hijack and the annoying ads are just a few of the many concerns related to this program. It is highly advisable to remove Games Charm from your computer as soon as you notice any signs, suggesting that your system has been infected. To know more to what specific aspect to pay more attention to, please keep reading this article. However, if you want a quick virus removal, just obtain a reputable antivirus software, such as Reimage, and scan your system for malicious files. When Games Charm adware infiltrates the system, you system may start acting out. The web pages may take ages to load, and the browser may start crashing or freeze. These are a few of the very first signs that malware has infected the computer, yet they are often overlooked by the regular users. A much more salient quality of an adware hijack is its ads. 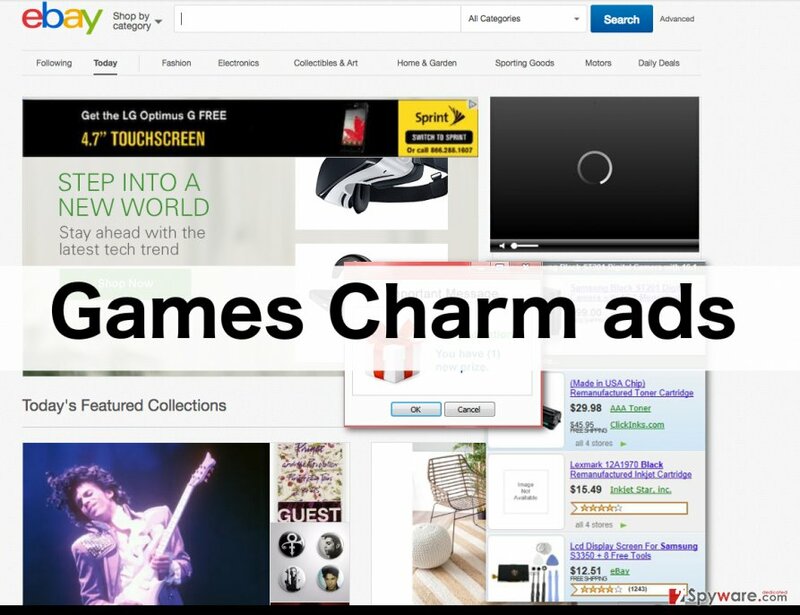 If you see advertisements labeled as “Ads by Games Charm,“ “Games Charm Ads“ it is another clear indicator that you should take your system’s security into consideration. If you ignore these ads and even decide to click on them, you might end up on suspicious sites and contaminate your system with additional adware, browser hijackers or other potentially unwanted programs. You should also be aware that Games Charm redirect the unsuspecting users to such sites via deceptive ads. So, despite how tempting these advertisements may sound, you should NOT interact with them. A combination of all the mentioned symptoms is a red flag for you to run a scan of your system with some reliable antivirus tool and to take care of the Games Charm removal ASAP. Just like any other adware program, Games Charm can enter your PC bundled together with some other freeware or shareware programs. Such deceptive method of distribution allows the potentially unwanted program creators to spread their software undetected. If you do not wish to take part in such deceptive marketing, you should obtain some reputable antivirus tool which would help you distinguish between the trustworthy and infectious downloads. What is more, you should take care of your computer’s health yourself by managing what programs can enter your computer. You can easily do that by choosing the “Advanced” or “Custom” installation modes when installing new software. There are two different approaches to Games Charm removal. You can do that either automatically or manually. The security experts always recommend the first option because it is much safer and quicker way to get rid of a malicious program. What you have to do is simply to obtain an anti-malware utility and to scan your system with it. Also, you should keep in mind that virus-fighting utilities require constant updating because new viruses are being created every day so their database should always be up-to-date. You can also remove Games Charm manually, but remember that such removal takes longer and different errors are more likely to occur. If you trust your skills, you can follow the instructions provided below and delete the virus yourself. Here, look for Games Charm or any other recently installed suspicious programs. Wait until you see Applications folder and look for Games Charm or any other suspicious programs on it. Now right click on every of such entries and select Move to Trash. When in the new window, check Delete personal settings and select Reset again to complete Games Charm removal. Once these steps are finished, Games Charm should be removed from your Microsoft Edge browser. Here, select Games Charm and other questionable plugins. Click Remove to delete these entries. Now you will see Reset Firefox to its default state message with Reset Firefox button. Click this button for several times and complete Games Charm removal. Here, select Games Charm and other malicious plugins and select trash icon to delete these entries. Click Reset to confirm this action and complete Games Charm removal. Here, select Extensions and look for Games Charm or other suspicious entries. Click on the Uninstall button to get rid each of them. Now you will see a detailed dialog window filled with reset options. All of those options are usually checked, but you can specify which of them you want to reset. Click the Reset button to complete Games Charm removal process. This entry was posted on 2016-04-26 at 04:35 and is filed under Adware, Viruses. You can quickly scan the QR code with your mobile device and have Games Charm ads manual removal instructions right in your pocket. How did you remove Games Charm ads?